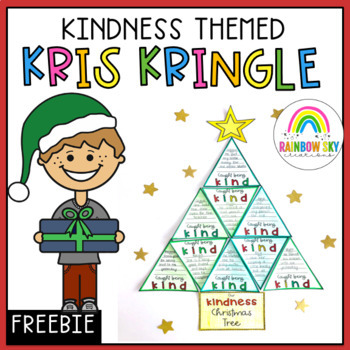 This resource is for students to explore the idea of being kind and completing random acts of kindness, especially leading up to the Christmas season. It focuses on showing kindness and recognising kindness in others. Firstly set up a Kris Kringle for your class. Put student names in a hat and ask them to draw a name each. The person they draw out is their Kris Kringle. 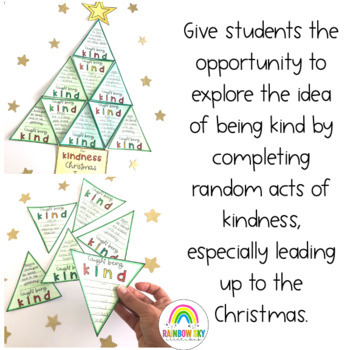 Instead of treating their Kris Kringle in traditional ways (with treats and small gifts) that student needs to focus on random acts of kindness for their Kris Kringle. Examples may include helping them collect supplies for a lesson, assisting them to pack their bag or carry items into class, complimenting them or sharing a treat during break time. Ask students to become aware of the acts of Kindness around them. After a few days, give each student a triangle to record a person and the act of kindness they have seen or experienced. Alternatively, you can have these set up and students can complete at any time throughout the day. Put the triangles together to create a Christmas tree of kindness. We hope you and your students love this resource!